There was a crash yesterday morning between a motorcar and motorcycle. 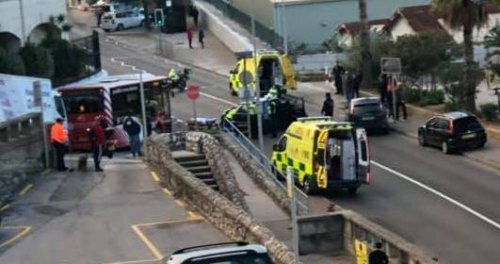 Emergency services were in attendance and Rosia road was closed, affecting traffic travelling from town and going towards town, which had to divert round the Rock or down Europa Road. The rider was conveyed to hospital with suspected head injuries. He was treated at hospital where it has been ascertained that injuries weren't as serious as first thought. No danger to life, said police. "Its about time they did something about this, the traffic shouldn't turn left to go up to St Joseph school, they should turn right and use the picadilly roundabout. I personally had the experience with my daughter having an accident in this same place, which happens often, and I hope they do something soon".